Built in 1987, Thomas J. White Stadium is just another one of those boring, impersonal stadiums that emerged from the era. Nothing in my mind stands out too much about this stadium, for good or for bad. If you look at the pictures below, you can tell it is quite bland and lacks anything interesting in its design. One thing that I really do dislike about the stadium is that it is entirely concrete, which I feel makes for a horribly impersonal baseball experience. There is nothing particularly bad about this stadium. But there's nothing particularly good either. Unless you are one of the Mets faithful, I would say skip Thomas J. 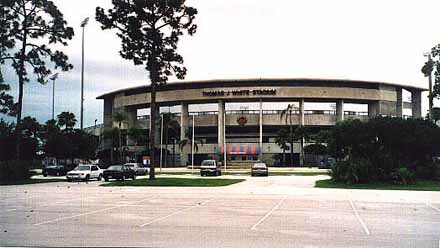 White Stadium. You may want to go here, to view an interactive panoramic image of the stadium so you can make your own judgement. The outside of the stadium is pretty boring and unimaginative. 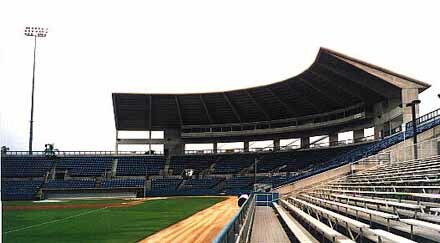 Compared to the Pirates grandstand in Bradenton, or the amazing exterior of the Twins facility in Ft. Myers, this is pretty dull. This huge roof is pretty unattractive, but it does indeed provide some needed shade from the Florida sun.